MARIETTA, Ga. -- Marietta city officials have approved site plans for the Atlanta United Football Club's training facility. The club’s state-of-the-art headquarters facility and training complex will be built on Franklin Road. City officials said Atlanta United will invest more than $50 million in the area, which they say will add about 80 "high-paying jobs" to the area by 2017. The training ground will be located on 30 acres between Interstate 75 and Franklin Road. It will have six playing fields and a 28,000 square foot facility that will serve as the home for the clubs first team and youth academy programs. COBB COUNTY, Ga. – The trial of the man accused in the hot car death of his 22-month-old son has been moved until April. Harris was arrested after his son Cooper was found dead in the back seat of a hot car on June 18. He faces multiple charges, including malice murder, felony murder and cruelty to children. The trial was originally set to begin on Feb. 22, but has been moved until April 11 due to a change in a lawyer’s schedule. Motion hearings will be held on Jan. 22 and in February. A judge not yet to rule on a motion by Harris's attorneys. They want certain evidence thrown out, claiming police illegally searched and seized items like phones and computers. COBB COUNTY, Ga. – A Cobb County police officer accused of using racially insensitive language during a traffic stop has received his proposed punishment. Cobb County Police tell 11Alive that they are not yet releasing details of Officer Maurice Lawson's "disciplinary proposal" because he has hired an attorney and asked for a hearing. That hearing will take place on Jan. 13. MARIETTA, Ga. -- Cobb County police are investigating an armed robbery at an area automotive supply store. Police said the armed robbery happened at the Pep Boys store in the 2800 block of Austell Road in Marietta around 8:30 p.m. According to investigators, a suspected black female entered the store through a side door at closing time and demanded money from the manager. After receiving an unspecified amount of cash, the suspect ran north from the scene. She is described as being about 5 feet 11 inches tall wearing all black including a black hoodie with a white design. She was also wearing blue latex gloves and a black ski mask. She was armed with a handgun. Anyone with information on the suspect is asked to call 770-499-3945. MARIETTA, Ga. -- Cobb County police have identified a man killed in a Thursday evening fatal accident involving a car and a pedestrian. Police said 36-year-old Michael M. Mills was attempting to cross at the intersection of Austell and Pat Mell roads in Marietta, Ga.
That’s when a blue 2001 BMW 525i traveling south on Austell Road struck Mills. Mills was taken to Wellstar Kennestone Hospital where he was pronounced dead. The driver, 20-year-old Jacob A. Black of Woodstock, Ga. was not injured. Police said that Mills was struck in a crosswalk but was walking against a traffic signal at the time. MARIETTA, GA (WXIA) -- Marietta Police were investigating a crash that happened on Roswell Road at North Marietta Parkway Tuesday evening, leaving one man with serious injuries. According to Marietta Police Officer Jared Rakestraw, Alexander Zimmermacher of Marietta was headed eastbound on Roswell Road in a 2003 Chevrolet Silverado. As he approached North Marietta Parkway, Zimmermacher's truck left the roadway and struck a utility pole on the south side of the roadway. Zimmermacher was transported to Kennestone Hospital in Marietta for treatment. Marietta Police were still investigating the accident late Tuesday evening. 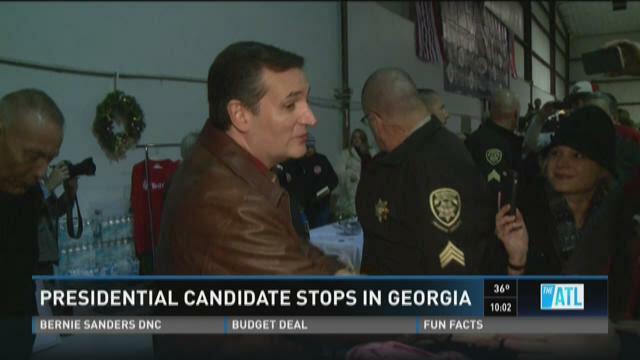 COBB COUNTY, Ga. -- Hundreds braved the weather in Cobb County for a chance to see Sen. Ted Cruz, as he tries to build momentum in the so-called SEC primary states, which include Georgia. Cruz was more than an hour late to the rally, but he still got a warm reception from the crowd who braved the bitter cold to meet him.